For tubes from 0.6mm to 3.1 mm outer diameter. Made of plated spring steel wire. Has self-closing jaws with flanger grips. About 16cm long. - Made with Die casted material. 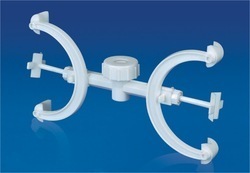 - Specially design for catching object up to 75mm dia object. We are offering Pulley Clamp Pattern. This pulley is specially designed for screwing to a parallelogram of Force Apparatus. This pulley will accept 25mm thick board. 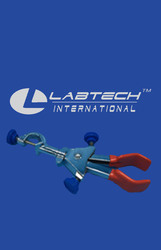 We are manufacturing a wide range of laboratory products like Buret Clamps. These products are made from quality materials to ensure preciseness and accuracy. Our products are widely used in laboratories of schools and colleges. Non-corrosive clamps grip the burette firmly without obstructing graduations. Burettes are inserted easily by pushing the concealed steel spring and are held on rubber pads, which prevent slipping. Made of polypropylene. Strong die-cast construction. Covered jaws for protection and grip. Swivels 360 degree and can be locked in any angle Jaw opens to 4, accepts rods up to 20mm. Total Length 7.
ficher type (polyethylene) non corrosive holds burette firmly and exactly in right angle. Rubber at arm prevents burrette from slipping, tappered edges give firm grip on rods upto 1/2" dia.